We succeeded in growing single crystals of the ferromagnets EuPd2 and EuPt2 with the Laves-type cubic structure by the Bridgman method. 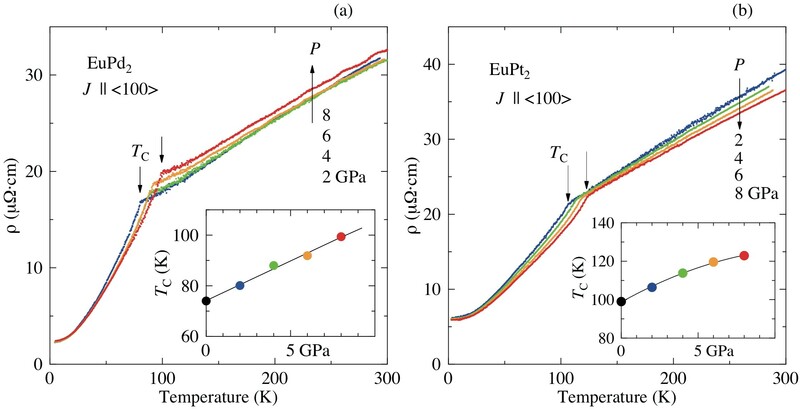 The ferromagnetic properties of EuPd2 and EuPt2 with Curie temperatures of 74 and 100 K, respectively, were confirmed from the results of electrical resistivity, specific heat, and magnetization measurements. The ordered moment is 7μB/Eu, revealing the Eu-divalent ferromagnetism. The present Eu-divalent electronic state is found to be robust against high pressures of up to 8 GPa and is not changed into the Eu-trivalent state. We also carried out de Haas–van Alphen (dHvA) experiments for EuPd2. The detected dHvA branches in EuPd2 are well explained by the relativistic linearized augmented plane wave (RLAPW) energy band calculations for SrPd2, revealing a closed hole Fermi surface and compensated four closed electron Fermi surfaces.